We will commit to “Eating Clean”. We will commit to exercising 5 days per week for a minimum of 45 minutes per day. This month is all about really looking at the food we are putting in our mouths and being able to make food choices that work in favor of our weight loss and health goals, not against them. People tell me all the time about how they are working out consistently and not losing weight. They tell me about how they have added green smoothies and more fresh fruits/veggies to their diet but they have not dropped pounds. Most of the time, the issue is that they have not stopped eating highly processed foods, sugary foods and food that is full of trans-fats. This month we will work to clean up our eating habits and make sure that our exercise efforts are not hindered by our diet. How do you join the challenge? – You are committing to actually DO what is outlined in the challenge goals above and to check-in on our online community (as a blog post or status message on your profile) or on our Facbook page EVERY WEEKEND. WE do this to keep one another accountable to our collective commitment. We also do this to get support from others and give encouragement to those who are on this journey to health and wellness with us. When you eat clean you will be eating unprocessed, whole foods that are prepared or cooked in ways that don’t add extra chemicals and toxins. We are talking about fresh fruits, fresh vegetables, lean meats, meat substitutes like tofu, soy, whole grains, lots of water, healthy dairy and fresh juice. We will avoid fried food, fast food, junk food, bleached white flour, artificial ingredients, soda, commercial juice and sugary drinks, processed sugar (white sugar, corn syrup), and foods with preservatives, toxins, dyes, saturated fat, and trans fat. You will likely be cooking at lot of food at home, making green smoothies, eating salads, looking for healthy snack, and really realizing just how healthy you’ve really been eating. Here is the list of approved Clean Eating foods that we will use for the challenge. The only change that I’m making to this list is that for our challenge you can eat ANY fresh fruits or veggies you like. Don’t worry about carbs from these whole and healthy foods. Great Recipes: I suggest that you visit eatcleandiet.com and cleaneatingmag.com for hundreds of free recipes and information on the clean eating lifestyle. For 3 weeks you will record everything you eat. You can keep a journal for the whole month if you like. Why? Food is 70-80% of the weight loss equation. You have to eat a healthy diet and commit to doing so as a lifestyle change to lose the weight for good. Starving yourself or using quick fix solutions will work in the short term, but they can cause health issues in the long run and/or will lead to the pounds coming right back. How do you keep a food diary? : You can buy a 3-8 inch notebook and keep it in your bag to record your eating. You could also create an online food diary instead. How you want to record your food is your choice. The key is to be consistent. FREE TOOL TO USE FOR THIS CHALLENGE: I suggest that you use myfitnesspal.com (or as a mobile app) to easily track your eating DAILY. We have a large group on MFP for Black Women Losing Weight members where you can connect with other Ladies who use the program. You will keep track of what you eat and the amount of calories, fat, carbs, and sugar in what you are eating so that you understand what is really going into your diet. You can find calorie counts on free sites like myfitnesspal.com and calorieking.com. Be consistent with your exercise 5 days per week for a minimum of 45 min each day. If you want to push yourself and do more, that is great, but let this goal be your baseline amount of exercise during February. What you decide to do for exercise is your choice. Walk, run, take a zumba class, dance around the house…you should do what you feel comfortable doing. I will post videos and workout suggestions here on the blog during the month. We can do this! Please post your questions below. What should Black Women Losing Weight’s December Challenge be? I will follow as you have stated for the month of February. Thanks for the help you give to us. I am also so glad to hear that you you are doing better healthwise. With God all thing are possible. I am ready for the challenge, with God’s help and support team we will make it through. Thanks so much for this site. I really need help and I will complete this challenge successfully! I will follow this challenge my starting weight is 181 and my height is 5 feet 1 inch this is important to me not only to be health but for transplant surgery. I am committed to the challenge. I just want to get healthy and look great!!! Better late than never. I will try this for February. They say 21 days can start a habit…..let’s see. This seems like a really good challenge. I am joining. Ajima, I wish you blessing and much strength. I am happy to accept the February Clean Eating Challenge and looking forward to energy boosting results. My goal is to lose 50 pounds; this challenge is a great jump start. I am eating to make my metabolism work better. So far, I have exercised 3 times this week to ZUMBA on the Wii for atleast 45 minutes. I am weighing in every Sunday which is tomorrow. This is great I already am doing most of the things on the challenge and use MFP for the past year, I have thus far lost 87lbs and wish to continue to lose an additional 100lbs so any information I am willing and able to try to get me to my goal. lost 3 pounds this week. Yay!!!!!! I have been at awe watching all the women of this blog lose all that weight. I have a special problem that I have to be able to address to help me lose the weight I know I can lose. I have Graves disease and when I was first diagnosed it was with Hyperthyroidism disease which allows you to eat like a horse and still lose weight. Now at two years after treatment which was a Radioactive Iodine Treatment I now have Hypothyroidism which is the slow form of this disease which makes your metabolism very slow. I am looking for some advice on loosing weight with hypothyroid disease from someone who has done it successfully. Can you help me? Hi Shelia, I’m not a medical expert and I would not want to give you any advise that would be adverse to your health. Have you discussed your weight loss issues with your doctor or a specialist? When I was diagnosed with Hyperthyroidism I lost 35 lbs. in a week. I had a goiter on my neck and eventually had half of my thyroid removed. Now I have Hypothyroidism and have been on Synthroid. I must say if you eat right and exercise you can loose the weight. You can do it, we can do it. I accept the challenge!!!!!! Ain’t nothin’ to it but to do it! I have the same problem, diagnosed with graves, hypothyroid and took the Iodine treatment. Now I can’t seem to loose the weight. I have been trying to loose the weight. I need this challenge to help me on my way. Sheila by no means am I giving medical advice. I am a Thyroid Cancer survivor/patient and I see my endo doc regularly but I have had success by cutting out lots of processed foods, its a slow process until your metabolism kicks in..I also do lots of slow cardio and always eat protien at each meal but it is the first thing I put in my mouth and I put all my meals in 1 cup containers and only eat what is in the containers. Hypothyroidsm is a monster and for the longest I thought I was destined not to loose weight it is not the case..lots of green leafy vegetables, good protien, fats, water is your best friend and spacing your meals….hope this helps…. ( my heaviest weight was 252 and not I am down to 219 as of this morning. Altough it’s the end of March, I plan on doing the Feb challenge for the next 3 weeks. I feel this is what I need to jumpstart my metabolism. I had 2 thyroid surgeries a year ago and my endo dr says my blood work is “normal”. I stronglt disagree! I had a seroius health crisis in Dec 2010 which impacted my ability to walk as I previously did but I’ve enlisted the help of a trainer and have been walking at least a mile on the treadmill, using weights, and drinking green smoothies. However, I need to be more disciplined, consistent. Your site is an answer to prayer! My goal is to lose 75 lbs by March 2014 which equates to losing 1.5 lbs per week. I’m onboard…count me in! Thank you. I’m in with February challenge I did great with last month Green Smoothie challenge down 4 lbs and will still bring it with the clean eating/food diary, 5x week exercise challenge. Will check out the websites you suggested. The best to everyone. Great to hear that you lost weight with green smoothies! What does this green smoothie consist of. For info on green smoothies, please visit http://www.blackweightlosssuccess.com/ebook-drink-green-smoothies-a-beginners-guide-and-80-great-recipes/ We did green smoothies as meal replacements (replaced 2 meals per day with a minimum of 24 oz of smoothie) for our January Challenge and so many ladies lost weight. It was wonderful. It’s not gonna be easy, but I’m up for the challenge. I’m im!! I am in. I accept the challenge! I’m ready & dtermined…hope i can stay focused!!! I’m down! Let’s get it! I’m ready! Lets do it! I love this challenge. I am all in! I’m In….I’m excited & accept the Challenge!! Please count me in I would love to join! If any of you Ladies are currently on myfitnesspal.com, please add me busyb223. Count me in too! I use my fitness pal: beccabee38! Its a wonderful feeling and I love it. 45 minutes of exerise will be hard due to back and leg problems, but I am up for the challenge!!!! There are sit down exercises and low impact aerobic/indoor walks. On YouTube, lookup Leslie Sansone and Tiffany Rothe. I also have back and knee problems but theses workouts are great. I am definitely challenged by this. I accept! I’m in and proud of all my sisters desiring to live a healthy life. I’m all in. I accept this challenge. Ready for the challenge! 🙂 Lost 10lbs with the smoothie challenge so I will continue the Green Smoothie challenge in addition to other clean food. Any suggestions on snacks–does sweet potato chips count as clean? I’m so glad to hear that you lost weight with Green Smoothies!! I used both My Fitness Pal and FitBook. I love my fitbook because it’s small and I even fit it in my purse. Yes, I will be doing the challenge. Yes I will commit to this challenge. I look forward to taking the challenge beginning Monday, February 4. I am recovering from a trimalleolar fracture (I have a plate, six screws and three pins in my left ankle) and it’s been difficult for me to find a consistent exercise regimen. I walk to try and maintain mobility in the joint, but cannot walk for an extended period of time or long distances (one mile maximum). I welcome suggestions of exercises I can participate in for 45 minutes at a time. I’m recovering from major surgery so I sympathize with you. I won’t be able to workout other than walking, but I’m focused on clean vegan eating. There are sit down exercises that you can try. Tiffany Rothe onYouTube has short but effective sit down routines. Nothing gets me revved up like a good challenge. Count me in!!!!! !I must say I will miss my green smoothies….I tried to eat clean yesterday, and I failed big time, but Im not giving up. Im just curious is it typical to start eating right and then eat something thats not healthy then get a stomach ache? You don’t have to stop having the green smoothies. Green smoothies are clean eating! Am ashamed to say, but I cheated last month and did not go through to the end. This month, I promise to … so help me God. I’m in! I’m going to keep at this until I get rid of these 40lbs. It’s so difficult to stay motivated n focused! With all of these hormonal issues I’m up n down. But I know that I just have to gain control of these late night munchies! I look forward to this months challenge. I already exercise daily however I need to focus on my stomach, arms and upper body. I will incorporate green smoothies along with my other clean eating meals. I love the support from this group. I am ready for this challenge! I am so excited and cannot wait to get started. Thanks so much for this site. I really need help and I will complete this challenge successfully! I accept the challenge! One question, if we can eat as many fresh fruits and veggies can we still do the green smoothies…. wouuld hate to give them up since I have so much more energy with them and for some reason my personal summers (hot flashes) have decreased since I have been doing them. Sure, Why would you stop having green smoothies. They are part of clean eating. I’m glad to hear that you’ve have health benefits from green smoothies. Tell a friend. Hi Leslye, As noted above, all you have to do it commit to actually Doing the challenge and check-in each weekend to stay accountable. 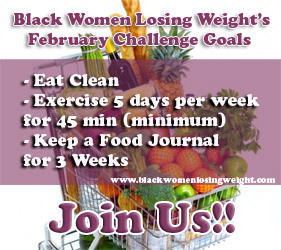 You can check in on our online community, http://www.blackwomenlosingweight.com as a blog post or status message. i am kinda new think you just accept the challenge read the research follow your self made plan and post your results, questions, comments etc…. I’m in, good luck everyone. I’m in! These goals line up with my own goals. I need the support. Thanks, so very much for the invitation. I need the incentive and the challenge. God bless!! Thanks, so very much for the invitation. I need the incentive and the challenge. God bless y’all. I will be doing the February challenge…..im ready !!! I accept the Feb challenge. And will continue to incorporate the green smoothies. It’s hard work. Even though I feel like I don’t see any weight loss. I will still press forward.And look forward to my sister’s for assistance. As I sit watching the 49 niners not do well against B-more, I peeked in online to see this latest challenge. Count me in! I accept the challenge. I wish others well on this journey as well. I’ll try this out. This will be my first diet with a group. I will do this challenge!! So excited!! Join us! We can do it. I live in the Bahamas and am ready to do this. I’m doing everything, I am starting with Zumba 6 days a week, taking Sundays off. I use the app LoseIt! I’M TRULY IN. WILL START TODAY SATURDAY. I NEED TO LOOSE 20 LBS. IM NOW 177 LBS AND CURRENTLY ON BLOOD PRESSURE MEDS. NOT GOOD AT CALORIE COUNTING BUT I WILL KEEP NOTE OF WHAT I EAT. MAYBE SOMEONE ON HERE CAN HELP ME COUNT ONCE I’M DONE. GOOD LUCK LADIES. I’m staring tomorrow. What do you do for breakfest? I need a new direction. I will try this for May. I was just diagnosed with diabetes and will not be taking medication for it. I am committed to do this challenge because I know by losing weight I can beat this diabetes.